Facts4Funs: Drunk Man Saved by Rail Road Worker from Oncoming Train! Truth or Troll? A video has recently emerged on Internet where a drunk man was saved by a rail road worker from on coming Train. many people believe it to be true many claims it to be staged and EDITED! 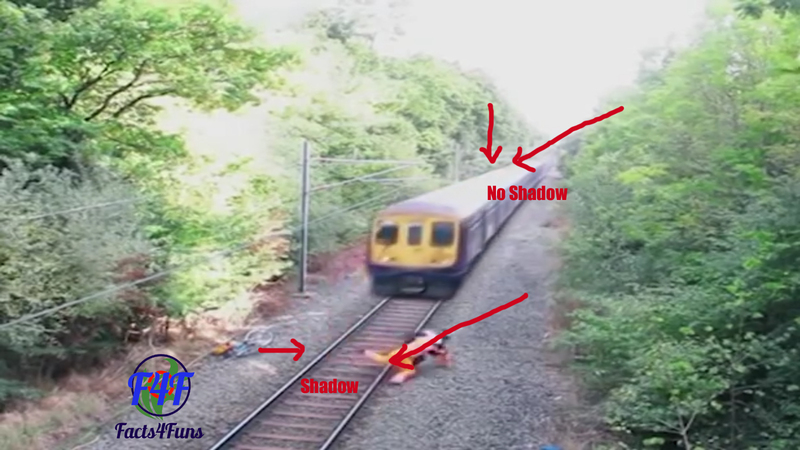 In the video a drunk man is seen to be crossing a Railway track and appears to get his bike stuck at the track. The Man then picks up the bike in the air throws it away near the track. 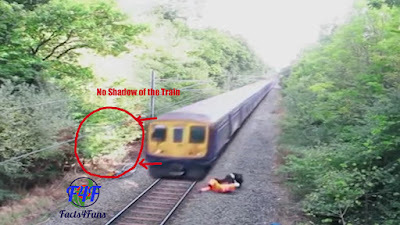 He then picks up some "Fruits" that he dropped in the middle of the track without having the knowledge of an upcoming Train behind him. Seeing this Rail Road workers petrolling nearby spots him and ond of the worker comes running and pushes him away before the Train hits him. The Video appears to genuin, but is it? Well my take on this is different. I know it's FAKE! Because if you look carefully at the video, you will notice that the worker casts a shadow on the left side of the image seen here. But when the Train passes by there is no shadow of the Train on the same side. Besides, there is no shadow of the trees and bushes of the right side on the roof of the Train. Closer observation also reveals that the Train contains a darkish aroma around it which is shaky if played on slow-mo. All these factors leads to the conclusion that it is EDITED and FAKE!